Like so many aspects of popular culture, radio has been labelled as ‘dead’ by many commentators, usually old hacks struggling with the changing dynamics between audience and media, trying to denounce what they don’t or can’t be bothered to understand, or ignoring innovation. 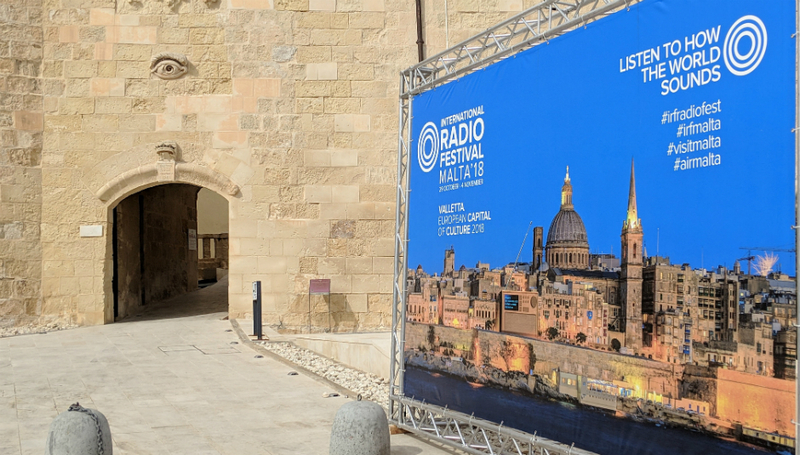 The gathering of world radio at this year’s International Radio Festival in Malta painted a much more positive picture, however, with vital international shows broadcasting live and the best minds answering questions about the future (and raising more) at its one-day Audio Conference. As Will Jackson, Conference Organiser and Managing Director of Audio UK, explained, “There has never been a more exciting time for radio.” But how true is this appraisal from inside the radio industry and what exactly does the future of radio listening look like? This is what DiS discovered at this year’s IRF. What ‘radio’ is, is changing? Statistics shared showed this in more detail showing that the listenership for 16-19 and 20-24-year-olds for AM/FM radio is just 12% compared to 45% for over 55s. For 16-19-year-olds it is now ‘on-demand’ services that dominate (with 60% of listener time) at the expense of all other physical and digital formats for music listening. In fact, Scott Cohen of music distribution company The Orchard passionately described radio as ‘dead’, a dying technology for a “passive” listening style that is outdated and not future-proof – it doesn’t belong in the next evolution of music consumption. They are not entirely wrong; the radio of the past is in fact ‘dead’, but to dwell on the negative conclusion is to ignore some very interesting developments and facts. Even the industry is starting to move away from the term ‘radio’, now often referring to it as ‘audio’. As young people move away from the term, radio creatives are moving with them. The conference happened on the day that the BBC dropped their BBC iPlayer Radio App in favour of BBC Sounds – a richer app, bringing together all the BBC’s audio content from radio shows to podcasts. With 80,000 hours of audio and a targeted focus on under-35s, it's clear that the BBC, who many broadcasters at IRF said are still world-beaters, are taking these shifts seriously. Sounds is the BBC’s attempt at challenging the changing demographics laid out by Trevor Dunn, but whether this is an indication of a complete move from the word radio remains to be seen. How would Radio 1 fair in this re-branding? More questions came up. Is podcasting radio? Mixes created and uploaded to the web? While the discussion rages as to what radio is, the fact is the same kind of content, created in the same way it has been for years, is still popular and resonating with audiences. The technological advancements, the democratisation of the medium, and its strong ties to community are also being largely overlooked, and certainly, the current audience figures and treads don’t support the idea of the demise. So, if the summation of radio’s (or audio content’s) death is premature, what is it that’s keeping it alive? Far from damaging what ‘radio’ is, technology is shaping what it can be. We exist in a transition period between the past and the future. Despite the proliferation of DAB radio, the FM (and even AM) bands still exist. Tempo, a key player at newly legit, previously pirate, station [Flex FM] (https://flexfm.co.uk/) in London, explained that they still broadcast on FM because of the number of cars still out there with FM radios. A lot of their listenership tune in on the go, and while this is the case FM will hang on by a thread. Then it will die, and with it, pirate radio. With the new technology and legitimate platforms to use, passionate broadcasters will no longer take the risks of old. One such platform that has shifted the paradigm of “radio” is Mixcloud, which has truly democratised audio content and now hosts over 12 million radio shows. From big players like NTS and The Guardian to bedroom dabblers, it’s created a new legitimate avenue for those passionate about music to share their ‘shows’, while, because of the company’s rights agreements, artists get paid without it bankrupting underground and community productions. With tagging, audiences can discover shows and mixes by genre and based on what they have already listened to, making it a strong recommendation engine for listeners as well as a strong platform for producers. It is a legitimate hub that connects the old style of radio, with the future of listening habits successfully. The BBC also has a 100-person voice team researching the possibilities of smart speakers, not simply to value the corporation but to present findings to the industry. Here, the license fee is paying to explore the new dawn for audience interaction, or as Nicky Birch, Executive Producer at BBC Research & Development said, exploring the value of this ‘stepping-stone’ tech that will lead to the next innovation. “This is technology, not magic,” said Cliff Fluet, a blockchain champion, about the tech advancement on everyone’s lips. Most in the room remained clueless, which he suggested he expected. If we match the public understanding level to the history of the world wide web, he states we are in 1995 right now – the beginning of public knowledge of the platform. They may never fully understand but applications will come that make it accessible to us all. For example, its security and data exchange capabilities could have profound effects on how audio is delivered and how artists get paid. Certainly, there is a wealth of activity in the area with Imogen Heap’s MyCelia project, Matt Sorum’s Arbit and Spotify’s recent acquisition of Mediachain. With Audius, blockchain’s answer to Soundcloud, launching in September and the Volareo blockchain smart speaker in a crowdfunding stage, it’s clear that it won’t be long before the future possibilities of the innovation will start to make a difference for music fans. Xanthe Fuller, Head of Community at Mixcloud, considering all the changes, explained that what they have done is widen the remit to give both listeners and passionate creators what they want. Despite changes in delivery, many people still want to hear a human voice that they trust and have that interaction – passive or not, this is still important. In terms of music, a human voice, that you trust, giving you the music you want is still a powerful tool. In a world of algorithms, the human connection is still needed. Another key point is how easy it is for people to create this audio content. Cheap laptops, quality microphones, and free editing software means that anyone anywhere can create podcasts, and through platforms like Mixcloud, can put them out to the world. As more and more diverse voices get a platform, widening the type of content available, this does reduce the listenership of the big players, creating niches and communities in abundance. “The challenge has always been how to monetise the content. Alongside the traditional model of producing content for broadcasters such as the BBC and commercial radio, we're now also seeing a real market emerging with platforms such as Audible and Spotify commissioning content, and Acast and Audioboom, as well as voluntary subscription platforms like Patreon, helping producers monetise podcasts,” says Will Jackson. So not only can people create with ease, there is a growing market for them to get paid for quality content as well. In fact, Xanthe Fuller explained that in addition to their artist rights payments deals, Mixcloud is in the process of launching a new subscription model which will allow creators to get paid as well. This has created a great situation for music fans – as “niche” becomes the norm, finding even the most obscure of sounds on the digital radio dial, from across the globe, is increasingly easy. Want the best in underground electronic music? Want to hear a weekly show from a shoegaze fanatic? A funk show from the depths of Africa? All can be found. We now have an abundance of stations that never think in mass market terms but concentrate on providing the right programming for the right people – the pirate ethos is becoming the norm. This was highlighted by Flex FM’s return to the IRF. A pirate station in London for over 20 years with a serious following, they recently applied for a community license and went legit. In a climate where niche programming is more and more accepted, they aren’t needing to illegally push their love of dance music out. With a licence and the Internet, they can actually expand their brand whilst retaining their exact ethos. Formed by Gordon Mac (often called the Godfather of dance music), Mi-Soul radio allowed him to bring the original music of his legendary pirate station Kiss FM back, focusing on all things soul. On the conference panel, Lindsay Wesker pointed out that the station came about because they realised that a lot of their old audience still wanted what they used to offer. They built a community around the loose definition of ‘soul’ music and they continue to grow. And niche is not only the domain of the smaller broadcasters. Paul Sylvester, Content Director at Absolute Radio, explained the station’s innovative Decades strategy, creating a series of audience-led, spin-off stations based on the music of different decades. So far, so standard. But it’s what they’ve done with the Breakfast Show that raises some interesting ideas for the future. The same show runs across all the Decades stations, with niche programming from 10am onwards. This obviously creates a problem of listeners not getting the music they want at breakfast. Using their systems, Absolute have created a process where with a series of live presenter conversation, pre-recorded links, and specific music, they’ve found a way for listeners to get the presenter they want with music tailored directly to their tastes. It’s certainly popular, with their 80s brand gaining 1.8 million listeners a week, and the 90s, 1 million weekly. Is this an approach that could be applied more widely? If you like a presenter but not the music they play (or are forced to play), could you tailor the experience further to your tastes? IRF showcased a phenomenal number of diverse shows, with Kasheme Zurich’s ‘Flying Carpet’ providing a highlight. Usually broadcasting from their bar/record shop/studio, they invite DJs, producers, and musicians from across the world to drop a “selectors choice” through audio and video streaming. The IRF show was a trippy journey through worldly funk sounds, that was out-of-step with the rest of the festival but a real wonder. Kasheme wasn’t the only station to highlight community at IRF. When being considered for a community license, it was Flex FM’s youth work and community spirit that won the regulators over as much as their broadcast experience. From our UK bubble, it’s easy to forget when radio had massive influence and literally united communities, but take Guernsey’s Island FM where listeners still use it as a primary source of information about their island, or on a much larger scale, RJ Devaki, who with Red FM India’s ‘Morning No. 1’ show, attracts tens of millions of listeners (the station attracts an average of 30 million). She has so much sway that authorities such as the AMC, the mayor of Ahmedabad, and the Police Commissioner all use her show to directly put out their message, whilst going to Devaki directly for advice on important matters. Although things are changing, it remains clear that the human voice via radio still connects on a mass scale, but now in 2018 has the ability to connect smaller communities in profound ways. There is a community for everyone to join – whether that is creatively or as a listener. As well as shows that exist now, IRF highlighted the exciting junction we are at in terms of our listening experience with radio. The future sounds good.